​In Acts 20, we read about the Christians of the early church coming together upon the first day of the week to break bread. The text specifies that the days of unleavened bread had concluded, but Paul and those who traveled with him gathered with others in Troas upon the first day of the week before setting sail to break bread once more. This breaking of bread was not for the feast of the Passover as were the days of unleavened bread, but pertained to a memorial that Jesus instituted on the night that he was betrayed for his followers to observe in remembrance of his sacrifice made on mankind’s behalf. When we hear the word memorial, perhaps we begin to consider some mental image that brings to mind memories about something, or in regards to someone’s life. In fact, the word memorial is defined as something designed to preserve the memory of a person or event, as a monument or a holiday. When I think of grand memorials here on earth, a certain city comes to mind which is our nation’s capitol, Washington D.C. I had the privilege of touring this great city around five years ago or so, and everywhere I went throughout the municipal, a new monument or memorial would stand out to me that I had not seen. There were three memorials in particular that stood out to me. First, the John F. Kennedy memorial had a flame placed at the forefront of his grave known as the “eternal flame.” Appropriately described, this flame is never extinguished, representing how JFK’s influence will never cease to glow. Another memorial that impressed me was the tomb of the Unknown Soldier. A widely heralded memorial, this mausoleum contains the remains of a soldier who was unable to be identified by name due to the bodily carnage suffered in battle. Nonetheless, this memorial represents any and every soldier who gave his life for this country’s freedom! When you stand at this memorial, there is a very solemn feeling in the air, as if you were witnessing a sacred ceremony. It’s taken so seriously that a sentinel marches 21 steps down the black mat behind the Tomb, turns, faces east for 21 seconds, turns and faces north for 21 seconds, then takes 21 steps down the mat and repeats the process. A changing of the guard occurs every hour on the hour for six months out of the year, and every half hour for the other six months of the year. A sentinel marches at the rear of the tomb 24/7/365 come rain, sleet or snow. I’m told that the number twenty-one was chosen because it symbolizes the highest military honor that can be bestowed—the 21-gun salute. It’s really a sight to behold. All of the memorials were impressive, but the one that stood out most to me was the Martin Luther King Jr. Memorial. I had expected to see a statue of Dr. King the man but, like the other memorials, much thought had been implemented into the construction of the monument. It was not merely some statue of a man, but rather it looked as though MLK was breaking out of a mountain of rock. As it stands, there is a phrase etched across the side of the large tribute that reads “Out of the mountain of despair, a stone of hope.” When I saw the memorial, I immediately thought of Dr. King’s famous speech “I Have Been to the Mountaintop,” recalling how he had helped America break away from the traditions of racism through the Civil Rights Act and other groundbreaking achievements, causing the racial barrier to crumble. ​The purpose of all these memorials was to bring many people together in one place, simultaneously, & the symbolic aspects of these landmarks caused everyone assembled to think of the various aspects of that person’s life. In like manner, the memorial Jesus left causes his disciples to come together in one place on a certain day, the first day of the week, to remember the impossible feats that Jesus Christ accomplished on our behalf. The instructions for how his memorial was to be remembered are seen in I Corinthians 11:23-26, but the larger point of this article is to help us understand that there are two major differences between man’s memorials and Christ’s memorial: (1) the Savior’s is the divine memorial of a man who fulfilled things that no memorial made by the hands of mortals could hope to accurately capture. His impact could only be remembered through an eternal institution, the picture of selflessness, rendered in simple fashion. (2) The purpose of a memorial is to commemorate someone who has ceased to exist. But Christ’s memorial symbolizes the memory of a man who was raised from the dead and lives on even today, sitting at the right hand of God’s throne (Luke 22:69). For those reasons, the institution of Christ’s tribute on the night that he was betrayed (Matthew 26:26-30) makes it the greatest memorial! 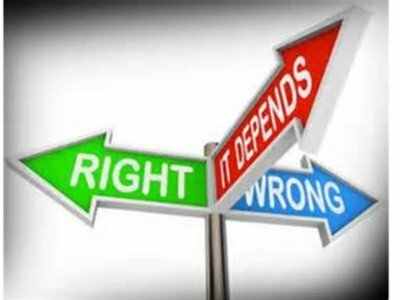 Did Jesus Condone Situational Ethics? ​In Matthew 12:1-8, Jesus’ disciples are accused by the Pharisees of violating law when they rub heads of grain between their hands on the Sabbath day, a day of rest from work. Jesus responds by referencing an instance in 1 Samuel 21 where David did what was unlawful in a do-or-die circumstance. Many a people, including some Biblical scholars, have purported that Jesus was here consenting to situational ethics. In other words, Jesus is being credited as saying, “Desperate times call for desperate measures, and sometimes circumstances allow grace for actions that would normally be wrong.” What does Jesus mean when He responds to the Pharisees in Matthew 12:3-8? ​There are five major truths Jesus asserts in his six-verse response. He first compares Himself to King David. This is more noteworthy than at first glance. Nathan declares a prophecy in 2 Sam. 7:12-17, stating that David would have an offspring who would sit on his throne and establish an everlasting kingdom. Many times in the gospels, men, women, and even demons decry Jesus to be the Son of David (Matthew 9:27-31; 12:22-23; 11:4-5; 15:21-28; 20:29-34; 21:9; 21:14-15; 22:41-46). Matthew starting his gospel declaring Jesus as “Son of David” is no coincidence either. In Matthew 12:3-4, Jesus further evidences being this prophesied Son of David by highlighting that He is mimicking David in action. Jesus is claiming self-fulfillment of the Messianic Son of David title. ​Second, Jesus is actually claiming that He has authority for His actions on the Sabbath, just as David had authority for his seemingly unlawful behavior. Read 1 Samuel 21:1-9. Notice that Ahimelech the priest gives David permission to eat the otherwise holy showbread as long as, “the young men have at least kept themselves from women,” (v. 4). Such an exception to the rulebook cannot be found in the Law of Moses. Where did Ahimelech get this concession? Notice 1 Samuel 22:10. Doeg retells the story’s events to King Saul, noting that Ahimelech inquired of the Lord before giving David provisions. Furthermore, 1 Samuel 21:9 notes that Ahimelech had the ephod. The ephod was a vest worn by the priest when ministering before the Lord or inquiring of the Lord (1 Sam. 2:28; 23:9-10; 30:7). The significance of the ephod’s mention in 1 Samuel 21:9 is this: Ahimelech inquired of the Lord, whether or not it was okay to make an exception to the rule in David’s dire situation. The Lord, by special revelation, gave the command that Ahimelech relayed to David. David and Ahimelech did not simply “feel compelled” to make exception like King Saul who offered an unlawful sacrifice in a similar time of dire straits (1 Samuel 13:12). ​Third, Matthew 12:5 alludes to another scripture in Numbers 28:9-10 which gave exception for priestly sacrifices on the Sabbath. Jesus’ point: there are some exceptions to law revealed in God’s word, and Jesus’ disciples have authority for rubbing head’s of grain together on the Sabbath. While the Sabbath forbade work, this was occupational work under Moses’ consideration. Read Leviticus 23 and notice each time Moses commands that no work be done on the holy days listed. Particularly note the Feast of Trumpets (v. 25). No “customary work” or “occupational work,” as properly translated, was to be performed on this Sabbath month of rest (i.e. Lev. 23:7, 21, 36). The disciples of Jesus were not breaking the Law of Moses by simply picking heads of grain (see also Deuteronomy 23:24-25). ​Fourth, Jesus rebukes the Pharisees for elevating their man-made law above the laws of God. He quotes from Hosea 6:6 when He says, “I desire mercy and not sacrifice.” Jesus quotes the same verse in Matthew 9:13. Notice the context of Hosea 6. The nation of Israel speaks in verses 1-3, and then God rebukes Israel in verses 4-10. God rebukes Israel for fake repentance and disobedience. “Mercy” is singled out as a paramount symbolization of faithfulness to God. In other words, God is saying, “I desire faithful obedience instead of your sacrifices that I didn’t even ask for!” Does this not echo 1 Samuel 15:22? Jesus quotes Hosea to the Pharisees, essentially saying, “I would that you were faithful to God’s law rather than the man-made traditions you have elevated above the law.” Josephus, in his writing of Jewish Antiquities, The Life, and Against Apion, cites Pharisaical traditions similar to the one Jesus’ disciples are accused of breaking. ​Fifth and finally, Jesus lowers the boom on the Pharisees by ascribing an identity to Himself that surely would have hastened His death had He not been in His popular home base of Galilee. He utters, “The Son of Man is Lord even of the Sabbath.” The theologically loaded phrases “Son of Man” and “Lord” will go without comment in this study, but examine the title “Lord of the Sabbath.” Read Genesis 2:1-3. Now, sit back and smile in realization that Jesus claims to be Yahweh, the very God who sanctified the Sabbath on the 7th day of creation. Jesus is reckoning the Pharisees as fools for quibbling the subject of the Sabbath with the very God who made the Sabbath holy. Jesus is no created son of men. Jesus is the Son of Man (Daniel 7:13-14), the Lord of all men, and Yahweh God who created the whole earth. Let every knee bow before Jesus Christ.